Following sessions in Bequia, Union Island, Colonarie and Barrouallie, the final event took place at the Methodist Church Hall in Kingstown in the presence of a small group of persons. A presentation of the plan was made by System Advisor Dr. David Lee, who gave an overview, highlighting among other things, its description, objectives and management plan. 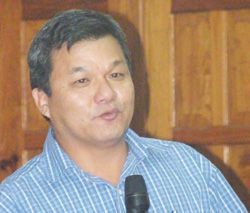 The presentation was followed by an interactive session, where questions and concerns were directed to Lee and other members of the National Parks, Rivers and Beaches Authority. Following the culmination of the consultations, persons with queries and concerns have 30 days to make their concerns known, this will be followed by an updated and approved system plan being placed before Cabinet by Tourism Minister Glen Beache for approval and enactment into law in Parliament. Beache, who was present at the consultation, said he hoped that the process would be completed by the end of the year. Fourteen historic, recreational and cultural sites around St. Vincent and the Grenadines are currently being developed as part of the System Plan, which is being funded by the European Union.